Win #5, Championship #3, and a top-10 against the PA Posse! The efforts and work put in by myself and my team all cultivated to one moment on Friday. We entered the night at Lernerville up by 9 points. That’s only a few positions. The 2nd place contender and myself started 5th and 6th on the grid for the heat race. He had a better start and jumped to 2nd while I filed into 3rd. That’s where we finished and he gained 1 point. He pulled before me for the feature and got 3rd. then FOR THE FIRST TIME ALL YEAR LONG, I was pulled to start on the pole!! We put a proven setup in the car, the track had bite around the top, I got a good initial start, and I drove as hard as I could. Flying through lapped traffic, we lapped up to about 10th. We held off Dale Blaney in 2nd and also Jack Sodeman Jr in 3rd. 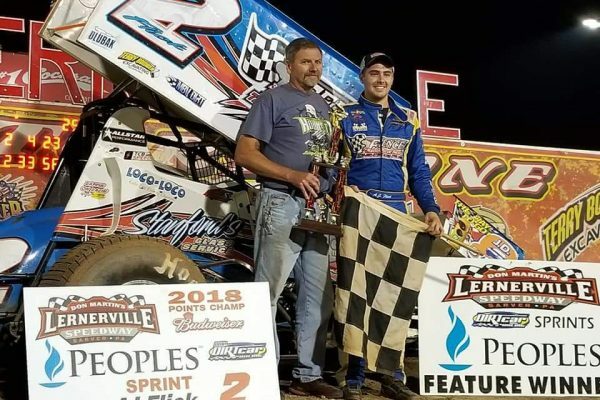 We held off any challenges from a late race restart and took the car to victory lane for the 5th time this year and locked up our 3rd Lernerville Track Championship!! The crew, family, friends, and myself were totally pumped up and it was an amazing feat to pull off. We changed up our ENTIRE package for Saturday and drove back out to Port Royal Speedway. Immediately, we felt and looked faster. The car was more stable and had a ton more drive. We drove from 6th to 4th in the heat race and almost had 3rd to put ourselves into the redraw. Then drove from 12th to 8th in the feature, while catching 5th-7th until our wing cylinder got bent and we fell to 9th with 5 to go. We showed a ton of speed at a track and on surface conditions where we usually aren’t as consistent. We were hoping for a slick track to experiment with some things but we still learned our fair share with the hammer down track that we were presented. Our team never gives up and we continue to get faster, even after 5 wins and another championship. I have always believed in the mentality that you need to travel, race new tracks, and against better drivers, as much as possible, to continue to improve. i’m blessed to be supported by good businesses and people that allow me to do just as much.